HAMMAMET, Tunisia (March 30) – For the third consecutive year, Nigerian women ignited for at least five African gold medals and nabbed the women’s wrestling team title. Nigeria’s women, who finished with 195 points, swiped medals in nine of ten weights and had five wrestlers reach the top of the podium at the African Championships in Hammamet, Tunisia. The five Nigerian gold medalists were Miesinnei GENESIS (50kg), Odunayo ADEKUOROYE (57kg), Sunmisola BALOGUN (65kg), Blessing OBORUDUDU (68kg), and Blessing ONYEBUCHI (76kg). Odunayo Adekuroye, the 2017 world silver medalist, was the only Nigerian wrestler to win a non-Nordic style bracket. In the 57kg finals, Adekuroye used a cross-ankle pick to score the 29-second fall over Cameroon’s Joseph ESSOMBE TIAKO, picking up her fourth consecutive continental title. The other four gold medalists won their titles by going undefeated in the round robin competitions. Meanwhile, the host nation of Tunisia (177 points), led by their 2016 Rio Olympic bronze medalist Marwa AMRI finished in second place with a pair of champions. Tunisia’s two winners were Amri and Faten HAMMAMI. In what was expected to be the women’s wrestling bout of the night, 62kg, Amri dumped Aminat ADENIYI (NGR) to her back and scored the early first-period fall. Amri’s title-winning performance on Saturday night in Hammamet gave her an eleventh continental title. She now holds ten African Championship gold medals and one African Games title. Faten Hammami won Tunisia’s second women’s wrestling gold medal after going undefeated in the 55kg Nordic bracket. The third-place finishers, Egypt (160 points), won gold medals in three Nordic weight categories. Their three champions were Hala AHMED, Eman EBRAHIM, and Samar HAMZA, who won African titles at 53kg, 59kg, and 72kg respectively. In Greco-Roman, Egypt (220 points) upended defending champions Algeria (192 points) by winning six golds and three silver medals. The six Egyptian champions were Moamen MOHAMED (60kg), Haithem MAHMOUD (63kg), Haithem MAHMOUD (67kg), Ahmed AHMED (82kg), Mohamed METWALLY (87kg), and Abdellatif MOHAMED (130kg). Of those six individual champions, Haithem Mahmound and Mohamed Metwally were the only two who competed in traditional brackets. At 63kg, Haithem Mahmound claimed his second consecutive African gold medal with a fall over Radhwen TARHOUNI (TUN). Mahmoud built a five-point lead off a passivity point and a pair of gut wrenches before stopping a Tunisian headlock to pick up the fall. The second non-Nordic bracket champion was 87kg gold medalist Mohamed Metwally. Metwally ended his gold-medal bout early with a four-point throw after commanding the 6-0 lead over Algeria Bachir SID AZARA (ALG), 10-0. Algeria, who had three individual champions and 192 points, finished in second place, 28 points behind Egypt. The trio of Algerian champion was Abdelkarim FERGAT (55kg), Tarek BENAISSA (72kg), Adem BOUDJEMLINE (97kg). 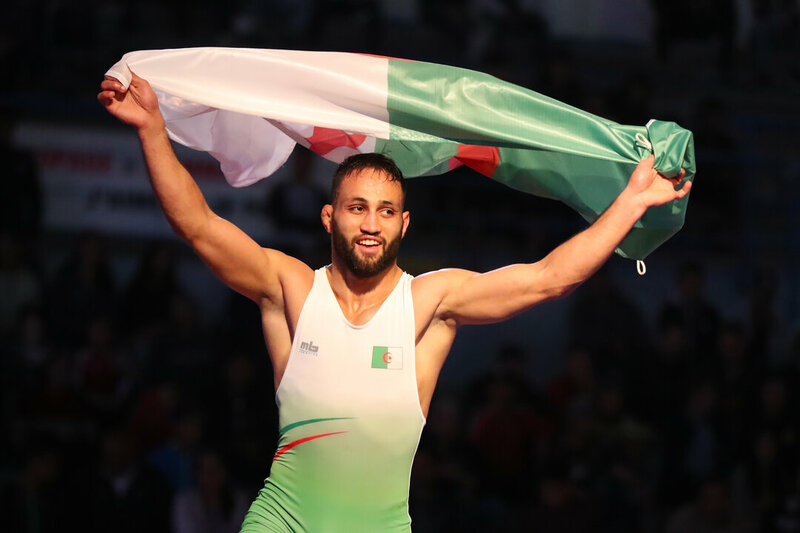 The tenth and final Greco-Roman gold medal of the day went to Zied AIT OUAGRAM (MAR), who won the 77kg title, improved on his runner-up finished from a year ago, claiming his tenth African title. The final day of wrestling at the African Championships begins Sunday at 10:30 (local time).